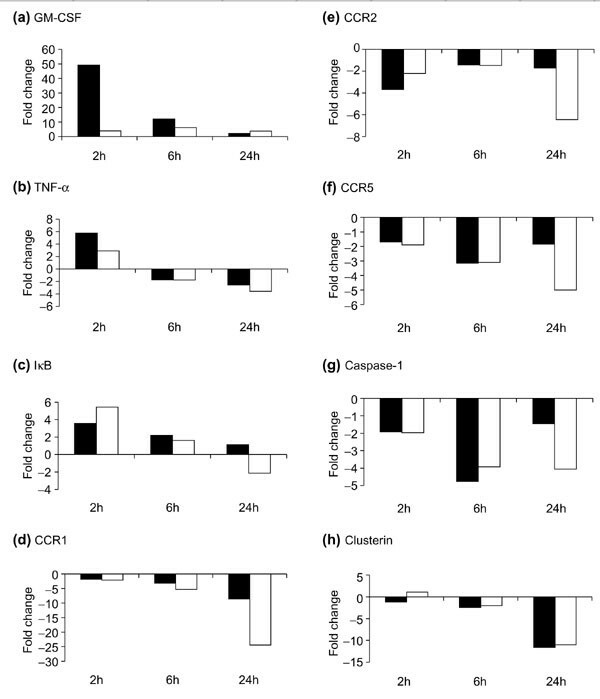 The development and activation of CD4+ helper T cell (Th) subsets with distinct patterns of unbalanced production of cytokines play an important part in infectious, allergic and autoimmune diseases. Human neonatal cord blood CD4+ Th cells can be polarized into type 1 or type 2-like effector cells in vitro by culturing them in the presence of interleukin (IL)-12 or IL-4, respectively. We have exploited this experimental system to identify marker genes that are differentially expressed by polarized Th1 and Th2 cells. An oligonucleotide microarray specifically designed to screen for inflammation-related candidate genes was used and the differential expression was further validated with a quantitative real-time RT-PCR method. In addition to the previously described marker genes of Th cells, we report subtle changes in the expression of several other genes that represent growth factors, receptors and other signaling molecules in polarized Th1 and Th2 cell subsets. Additionally, we describe a novel set of genes as Th1/Th2 differentiation markers for cells activated by anti-CD3 and anti-CD28 antibodies. This study demonstrates the power of the targeted use of microarrays in combination with quantitative real-time RT-PCR in identifying and validating new marker genes for gene expression studies. The functionally distinct repertoire of secreted cytokines of type 1 and type 2 CD4+ T helper cells (Th1 and Th2 cells) has been shown to play an important role in the pathogenesis of human allergy and inflammatory diseases . Effector Th1 cells secrete predominantly interferon-γ (IFN-γ) and interleukin-2 (IL-2) and regulate cell-mediated immunity against intracellular pathogens, whereas differentiated Th2 cells produce IL-4 and IL-5 and promote antibody-mediated humoral immune responses [2,3]. In several immunological disorders the balance between the type 1 and type 2 cells is disturbed and favors either a predominant Th1 response (autoimmune diseases) or enhanced Th2 response (allergic inflammation and atopic disorders) . Cytokines IL-12 and IL-4 play a major role in selectively regulating the development and differentiation of CD4+ T cell subsets to IFN-γ and IL-2 producing Th1 or IL-4 and IL-5 secreting Th2, respectively. This differentiation process can be mimicked in vitro. DNA microarray techniques can be used to study gene expression on a large scale [4,5]. The expression of a large number of genes can be monitored simultaneously and the expression profiles in different samples compared. Recent approaches in immunology exploiting this technology include the expression monitoring of changes caused by cytokines [6,7], viruses [8,9], inflammation [10,11] or cancers of hematopoietic origin [12,13,14]. The profiles of mRNA expression in human type 1 and type 2 Th cells are still largely unknown. An earlier report describing differentiating Th cells using an oligonucleotide array analysis led to the production of a large volume of data , but because of the experimental design the gene expression profile of Th2 cells remained obscure. We chose to study the expression of polarized T helper cells and describe the comparative analysis of effector Th1/Th2 cells. As a preliminary screen, a restricted number (250) of inflammation-related genes was included for validation. In a parallel analysis a quantitative reverse transcription polymerase chain reaction (RT-PCR) method (TaqMan) was used to evaluate the results. We show that an oligonucleotide microarray complemented by quantitative RT-PCR is an excellent method for gene expression profiling. The Roche PA-1 oligonucleotide array contained 66,176 features that correspond to 517 inflammation-related genes and was fabricated by Affymetrix. Among these, 250 genes were of human origin whereas the others represented mouse and rat genes. Each gene is monitored by 64 pairs of features that consist of 25-mer oligonucleotides, one perfectly complementary to the gene sequence and the other identical except for a single mismatch located in the center of the oligonucleotide. The Specificity and sensitivity of the current type of oligonucleotide array used are based on several criteria. First, the design of the antisense oligonucleotides was targeted toward a well annotated full-length cDNA sequence (without introns) for each gene. Second, the number of both perfectly and mismatching oligonucleotides (features) for each sequence was 64. When directly converted, the 32 specific oligonucleotides (25-mers) overlap 800 bp of sequence data. Third, for this preliminary screen the amount of mRNA used for in vitro transcription reaction was rather high, 1 μg. In principle this amount should represent even the low abundant messages needed for difference detection [16,17,18]. Lastly, the hybridization mixture was used only once and discarded. However, from our earlier studies  it was known that for abundant messages (such as IFN-γ) or very rare transcripts (IL-4) the linearity of detection in this type of hybridization-based method is largely compromised (102 to 103). We therefore have chosen a real-time RT-PCR method that facilitates quantitation of the transcripts over at least five orders of magnitude . To confirm the linearity of the detection for each gene dilution curves were created (see Materials and methods). In addition, on the basis of our earlier work , we knew that the differences in the expression for several of the key genes in effector type 1 and type 2 cells would be very small. To minimize individual variation the oligonucleotide array was first hybridized twice with a type 1 or type 2 sample that had been previously validated with known marker genes. A second aliquot of the same mRNA was then independently prepared and hybridized to a new oligonucleotide array manufactured within the same batch. After this, the analyzed data was confirmed in samples from other individuals with a real-time RT-PCR method. The expression of a total of 250 human inflammation-related genes was screened with an oligonucleotide array by performing two independent hybridizations with a Th1 or Th2 cell sample. The phenotype of these cells had been determined using ELISA as type 1 or type 2 (secretion of high IFN-γ, low IL-4, or high IL-4, low IFN-γ, respectively, data not shown). The differentially expressed human RNA transcripts of Th1 and Th2 cells are shown in Figures 1 and 2. The level of expression is shown as the average fluorescence intensity value for each gene in each sample. Collectively, 34 transcripts were recorded as differentially expressed in these cells (14 in type 1 and 20 in type 2 cells). The transcript of a proinflammatory cytokine INF-γ is abundant in type 1 T cells and very low in type 2 cells (Figure 1a). IFN-γ mRNA had routinely been measured with real-time RT-PCR from our cell cultures and the actual difference between the type 1 and type 2 cells was in the order of 103- to 105-fold. An oligonucleotide array, however, indicated less than 102-fold difference in type 1 and type 2 cells (78-fold, calculated from average fluorescence intensity values for IFN-γ: Th1 1567.8, SD 129.1 and Th2 < 20, SD 3.3). In clear contrast to IFN-γ are the transcripts of the IL-4/IL-13 cluster known to promote humoral type 2 responses. Despite their all (IL-4, IL-5 and IL-13) being detected as differentially expressed in T-cell samples by an oligonucleotide array (Figure 2b), reliable detection of both IL-4 and IL-5 failed in a customized RT-PCR setup, probably because of their low level of expression. Genes preferentially expressed in human Th1 cells as measured by oligonucleotide microarrays. Genes expressed at higher level in Th1 cells (black bars) as compared to Th2 cells (white bars) at day 14 are shown. Fluorescence intensity values for (a) genes with increased expression levels of >400, and (b) genes with expression levels increased by <400. Error bars indicate variation in two hybridizations from duplicate preparations of the same sample. Genes preferentially expressed in human Th2 cells as measured by microarrays. Genes expressed at a higher level in Th2 cells (black bars)as compared to Th1 cells (white bars) at day 14 are presented. Fluorescence intensity values for (a) genes with increased expression levels of >300, and (b) genes with expression levels of <300. Error bars indicate variation in two hybridizations from duplicate preparations of the same sample. The other transcripts expressed at a higher level by Th1 than Th2 cells are presented in Figure 1a,b. In addition to IFN-γ, these include IL-8, tumor necrosis factor-α (TNF-α) and granzyme B (fluorescence intensity > 400) as well as granulocyte-macrophage colony-stimulating factor (GM-CSF), macrophage inhibitory protein-1α (MIP-1α), MIP-1β, RANTES, IL-7 receptor (IL-7R), IL-12Rβ2, SLAM, CCR1, CCR2, CCR5, IκB, TIMP-1, c-Jun, IRF-1, caspase-1 and clusterin (fluorescence intensity < 400). Transcripts of MIF, IL-4R and STAT4 gave the highest relative fluorescence intensity values (> 300) in Th2 samples and their relative expression is shown as a separate graph (Figure 2a). The fluorescence values for all other genes that were expressed at a higher level in Th2 cells compared to Th1 cells were lower (< 300; Figure 2b). In Th2 cells, preferentially expressed genes include in addition to IL-4, IL-5 and IL-13, the transcripts for IFN-αβR, IFN-γRβ, fibroblast growth factor receptor (FGFR), CCR4, Smad2, BAX, CAS and caspase-6. Hybridizations of oligonucleotide arrays were used to screen a panel of genes in T cells that are differentially expressed by polarized Th1 or Th2 cells (Figures 1,2). To validate the observations, the same Th1 and Th2 samples were quantitated together with samples of cultured Th1/Th2 cells originating from other individuals by using a real-time RT-PCR (TaqMan) method. We designed probe and primer sets for the quantitative detection of mRNAs for 14 genes (Table 1; caspase-1, CCR1, CCR2, CCR4, CCR5, clusterin, FGFR, GM-CSF, IκB, IL-4R, RANTES, STAT4, TIMP-1 and TNF-α). In addition, we had earlier confirmed a differential expression of SLAM, IFN-γRβ and IL-12Rβ2 transcripts in these cells . All TaqMan RT-PCR measurements were carried out for each gene in duplicate. After three individual measurements the fold change in mRNA expression in Th1 cells compared to Th2 cells was calculated (Table 2). The overall transcriptional preferences recorded with a real-time RT-PCR method correspond well with the differences recorded by the oligonucleotide microarrays. The measurements from Th1 or Th2 cultures of other individuals further confirm this. When the calculated fold differences by the different methods in Th1 and Th2 samples are compared they are in most cases reminiscent but not equal. Because of a broader dynamic range of the real-time RT-PCR detection, we consider TaqMan results to be more reliable in this respect. In the case of the chemokine receptors CCR1, CCR2 and CCR3, where the expression level in Th2 cells is low, the sensitivity of the method becomes limiting and leads to higher values of standard deviation. The reason for the significantly higher fold difference values recorded by the oligonucleotide arrays for TIMP-1 and IL-4 is currently unknown. Most notably, even when the fold difference for some of the target genes (CCR5, IκB, STAT4) is low (< twofold) according to an oligonucleotide array analysis, the transcriptional preference in all Th1/Th2 samples is similar and the statistical significance high (p < 0.01). Abbreviations: FAM, 6-carboxyfluorescein; TAMRA, 6-carboxytetramethyl-rhodamine. †For calculations, see Materials and methods. ‡Same sample measured with both methods. §Data from Th1/Th2 culture samples representing three individuals were used. According to analysis of variance: n.s., not significant (p > 0.05); *significant (0.01 <p < 0.05); **highly significant (p < 0.01). Because cell activation is known to affect the transcription of genes in T cells , we next asked whether the cell activation also changes the level of transcription of genes in polarized T helper cells. Real-time RT-PCR measurements of gene expression were carried out with a set of 14 genes (Table 1) on three separate T-cell cultures. Polarized (day 14 cells) CD4+ Th1 or Th2 cells were triggered with antibodies for CD3 and CD28 for 2, 6 or 24 hours and gene expression was quantitated (Figure 3). During the time course of activation a general trend of downregulation of transcription was observed in the genes studied. The expression of a housekeeping gene, however, was unaffected (data not shown). The downregulation occurred within 24 hours in both type 1 and type 2 cells. Even the transcripts for GM-CSF, TNF-α and IκB, which were rapidly upregulated in the early activation period were downregulated soon after. Downregulation of expression was also seen for CCR1, CCR2, CCR5, caspase-1 and clusterin. Both T-cell subsets seem to exhibit very similar patterns of changes in the mRNA levels during activation of these genes, with the following exceptions. First, the early induction of GM-CSF and TNF-α expression is more pronounced in Th1 cells than in Th2 cells. Second, the downregulation of transcripts at 24 hours of activation for CCR1, CCR2 and CCR5 in Th2 cells is more effective compared to Th1 cells. The mRNA levels for RANTES, CCR4, FGFR and STAT4 in Th1 or Th2 cells did not respond to an anti-CD3/CD28 mediated activation signal or the observed changes were low (< two- to threefold). In conclusion, genes that responded promptly to the activation signal were GM-CSF, TNF-α, IκB, CCR1, CCR2, CCR5, caspase-1 and clusterin. Most importantly, activation-induced changes in expression of these genes did not affect the preferential expression pattern in Th1 and Th2 cells. Activation-induced changes of expression of genes in human Th1 and Th2 cells as measured with real-time RT-PCR. (a-h) Fold changes of expression of (a) GM-CSF, (b) TNF-α, (c) IκB, (d) CCR1, (e) CCR2, (f) CCR5, (g) caspase-1 and (h) clusterin in human Th1 cells (black bars) and Th2 cells (white bars). Activation was induced by coligating CD3 and CD28 in human Th1 and Th2 cells for 2, 6 or 24 h. Data are from samples from Th1 and Th2 cell cultures originating from three individuals. Each measurement was carried out in duplicate and repeated. We have used high-density oligonucleotide arrays to profile gene expression of cultured polarized human Th1 and Th2 cells. Many research groups, including ours, have intensively searched for genes that would be differentially regulated in human type 1 or type 2 cells and would potentially explain their distinct functions in immunological disorders . Until recently, only a few genes, such as those for cytokines, have been defined as differentially expressed in human CD4+ T helper subsets [1,2]. Classically, the definition of a type 1 or type 2 Th cell was based on measurements of a limited number of cytokines secreted by these cells after activation (by phorbol myristoyl acetate and calcium ionophore). Current developments in RNA technologies enable the basal level of gene expression to be studied in these cells. The research has been inspired by the discoveries of differentially expressed genes, first in mouse cells and then often followed by confirmatory discoveries in human T helper cells. These discoveries in human cell systems have included the differential expression of the receptor chains IL-12Rβ2 and IFN-γ Rβ [23,24], chemokine receptors CCR2, CCR4, CCR5 [25,26] and SLAM . Several attempts have been made to delineate a specific Th1/Th2 transcription factor, which would determine the development of different T-cell phenotypes . The role of such transcription factors as c-Maf  and GATA-3  in Th2-cell development and T-bet  in Th1 development is currently being extensively studied mainly in mouse models. In order to broaden the view on gene expression in human type 1 and type 2 cells we designed a microarray to screen for 250 inflammation-related human genes. With careful experimental considerations we are able to report subtle differences in the expression of 34 genes in polarized human CD4+ T helper cells that characterize their phenotypes and participate in their function. The immune response is mediated by the coordinated expression of growth factors and chemokines. It is characterized by the presence of several secreted mediator molecules (ligands) in variable doses surrounding the cell simultaneously. Therefore, both the type and the quantity of the ligands surrounding the cell, as well as the receptors on the cell surface, dictate the early events in a signaling cascade. Microarray profiles of human type 1 and type 2 cells reveal a large number of molecules known to potentiate inflammation responses. In addition to the proinflammatory molecules IFN-γ and TNF-α, the transcripts for GM-CSF, IL-8, MIP-1α, MIP-1β and RANTES were also preferentially expressed in Th1 cells as compared to Th2 cells. GM-CSF is often produced together with the proinflammatory molecules TNF-α and IFN-γ and its production by activated human T cells has been reported [1,31]. The expression profile of the type 2 cells has somewhat fewer inflammatory mediators than Th1 cells. In addition to interleukines IL-4, IL-5 and IL-13, only MIF mRNA was found to be expressed at a higher level in Th2 cells than in Th1 cells. The simultaneous expression of the classical Th2 cytokines IL-4, IL-5 and IL-13 is not surprising however, as it was recently discovered that they are all transcribed from a single gene cluster as a result of coordinated regulation [32,33]. Increased expression of MIF has been observed in activated mouse Th2 cell clones . Chemokines IL-8, MIP-1α, MIP-1β and RANTES are known to recruit neutrophils, eosinophils, macrophages and other lymphocytes to the site of inflammation . 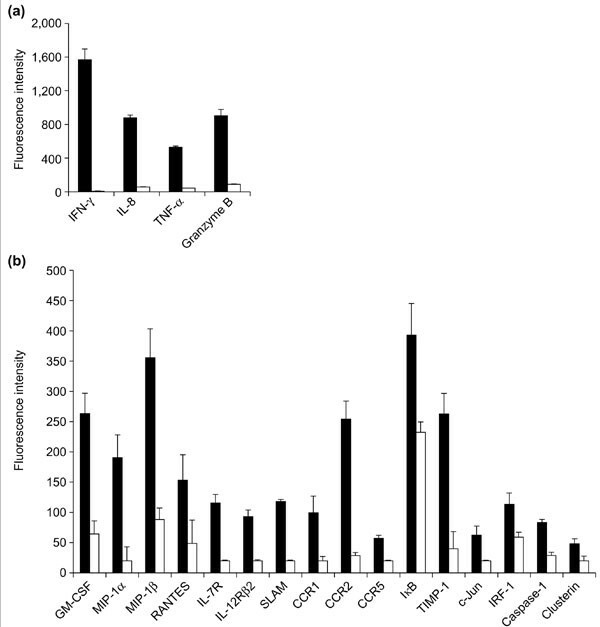 MIP-1α, MIP-1β and RANTES have previously been shown to be direct chemoattractants of Th1 cells [36,37]. These chemokines are promiscuously used by several receptors, but all three are ligands for CCR5, which has been shown to be preferably expressed in type 1 cells [25,38,39]. Therefore, it is of interest to note that the CC-chemokines and their receptors are coexpressed in Th1 cells. The coexpression is not only Th1 cell specific, but the similar expression pattern applies to Th2 cells that express CCR4 (this study, and [15,25,26]) and its ligand TARC  to which Th2 cells are also responsive . Because the gene expression profiles in this study reflect pure cell cultures of effector cell populations, it seems plausible that these chemotactic signals are actively used within the type 1 or type 2 cells. The comparison of the expression profiles of polarized T helper cells also reveals several differences in the expression of signaling receptor chains. Differences in expression of IL-12Rβ2 , IFN-γ Rβ  and SLAM  in human type 1 and type 2 cells have been previously described. T cells differed also in their expression for IL-7R, IFN-αβR and FGFR. Signaling through all three receptors is poorly characterized. Both IL-7 and type 1 interferons increase the survival of activated T cells [40,41]. Interestingly, it was recently shown that a specific effector dendritic cell (DC2) that induces primarily type 2 differentiation in T cells is the natural source of type 1 interferon in human blood . Our results indicate that at least the receptor chain IFN-αβR of the IFN type 1 interferons is preferentially expressed in Th2 cells and in lesser amounts in Th1 cells. At present it is not known why the basal level of transcription of STAT4 appears to be higher in Th2 cells compared to Th1 cells. This is surprising because under the culture conditions used for Th2 cells, the IL-12 is neutralized in the medium with an antibody, whereas in the Th1 cells the STAT4 is strongly stimulated. Also, there is no literature available as to whether the STAT4 expression levels are affected by signals from the type 1 interferon receptors. Functional receptors for FGF in some human T cells have been reported by Zhao et al. . However, our finding that FGFR is preferentially expressed in Th2 cells conflicts with a report by Rogge et al. , in which a 6.9-fold higher expression in Th1 cells was found. It is possible that the expression of FGFR does vary in the course of T helper cell development, depending on the state of differentiation and cell activation, because the observations in these papers are from different phases of T-cell differentiation. The oligonucleotide array used here measured the transcripts for relatively few transcription factors and, for example, c-Maf, GATA-3 and T-bet were not included. However, the differential expression of these transcription factors during human T helper cell differentiation has been confirmed in these cells (E. Ylikoski and R. Lund, unpublished observations). In the Th2 effector cell profile the preferential expression of Smad2 is still worth mentioning. The details of transforming growth factor-β (TGF-β) receptor signaling in T cell development, for which the Smads form the signaling cascade to the nucleus, are still poorly characterized. It has been suggested that TGF-β modulates growth and development of T-cell precursors during the early differentiation phase . In addition, more recent papers show that the inhibition of type 2 T-cell differentiation by TGF-β actually occurs by inhibiting the expression of GATA-3 in mouse [45,46] and that TGF-β regulates the Th2-related airway hyperreactivity in an animal model of asthma . The differential expression of several cell death- and apoptosis-related genes in Th1 and Th2 cells is also evident from the profiles created. Previous studies have indicated that T cells exploit different pathways for cell death [37,38]. Mouse Th1 cells were recently shown to be susceptible to activation-induced cell death (AICD) by Fas ligand, whereas Th2 cells were shown to be resistant to it [48,49]. This resistance was suggested to be characteristic of asthma [48,50]. A distinct panel of cell death-related genes preferentially expressed in Th1 cells includes those for granzyme B, caspase-1 and clusterin, whereas Th2 cells preferably expressed Bax, CAS and caspase-6. The differential expression of clusterin that was also sustained during T-cell activation is also interesting in the light of recent data suggesting that clusterin can act as a secreted chaperone in mammalian cells  and protects cells from the cytotoxicity of TNF-α . The preferential expression of TNF-α and clusterin in Th1 cells, together with the differentially expressed IκB and c-Jun, suggests that in addition to Fas/Fas ligand-mediated death, signaling through the TNF receptor family could also serve as an additional pathway to control cell survival and death in these cells. Systematic studies on cell death in Th1 and Th2 cells are needed to clarify this. To identify differentially expressed genes for the human T helper subsets that would not be affected by cell activation status, the effect of activation through CD3 and CD28 in human Th1 or Th2 cells was studied. During activation, most of the genes studied responded by downregulating the transcription to a basal or even lower level of transcription. This was also true for the transcripts of GM-CSF, TNF-α and IκB, which had been rapidly induced and subsequently downregulated back to the basal level. Most importantly, the transitional preference favoring Th1 cells, which have a higher level of expression of GM-CSF, TNF-α, IκB, CCR1, CCR2, CCR5, caspase-1 and clusterin compared to Th2 cells, did not change during activation, a feature potentially important with clinical samples of mixed cell phenotypes. In conclusion, microarray technology in combination with quantitative RT-PCR proved to be powerful in profiling the expression of inflammation-related genes in human CD4+ Th1 and Th2 cell populations. The expression patterns of type 1 and type 2 cells described here potentially reflect also the transcriptional patterns common in other type 1 and type 2 cells of the immune response . What we have shown here is that differences in the basal levels of gene transcription can be extremely small and yet can indicate essential functional outcomes of that particular cell type. We believe that the results presented here will provide valuable new insights into gene array discovery. In addition, they also provide a challenge to bioinformaticians to develop accurate algorithms for expression profiling. Human CD4+ T helper cells were isolated from neonatal cord blood and cultured in polarizing conditions for 14 days as previously described. Briefly, the stimulation of the cells was carried out by plating 1.0 × 106 T cells per ml and 0.5 × 106 per ml of irradiated (6400 rad) CD32-B7 transfected mouse L fibroblasts  and 100 ng/ml PHA (Murex Diagnostics, France) on 24-well flat-bottomed plates (Lindbro, ICN Biomedicals). Cells were grown in Yssel's medium supplemented with 1% of human AB serum (Gemini Bioproducts) and 100 U/ml human recombinant IL-2 (Cellular Products). Cell differentiation was primed with either 2.5 ng/ml human recombinant IL-12 (R & D Systems) or with 10 ng/ml human recombinant IL-4 (R & D Systems,) for Th1 or Th2 cells, respectively. Culture media for Th2 cells contained 10 μg/ml human recombinant α-IL-12 (R & D Systems). The cells were fed every other day and split at day 3-4 after stimulation. At day 7, cells were restimulated and cultured as described above for another 7 days. When cells were harvested for RNA isolation, an additional immunomagnetic purification step of CD4+ cells was performed (DYNABEADS M-450 CD4, Dynal A.S). The protocol for activating the cells through CD3/CD28 for 2, 6 and 24 h has been previously described . Monoclonal antibodies for CD3 and CD28 were from Immunotech and goat F(ab')2 antibody from BioSource International. 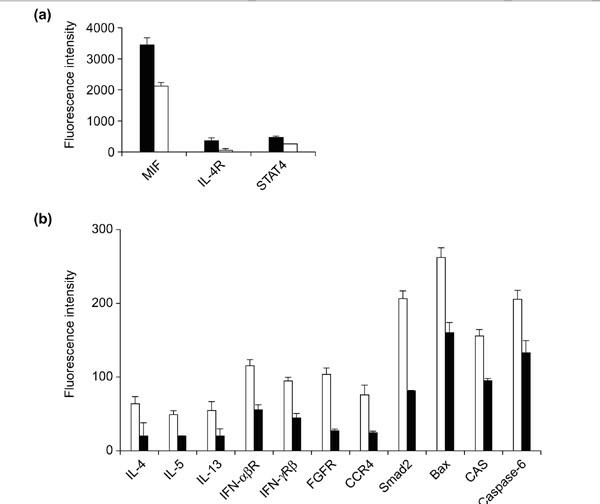 The phenotype of the cells was defined by measuring secreted IFN-γ and IL-4, corresponding to type 1 and type 2 cells, respectively, by ELISA (Genzyme). Poly(A)+ mRNA (1 μg) was isolated by two rounds of Oligotex purification (Qiagen). cDNA synthesis of mRNA, in vitro transcription and the production of a biotin-labeled RNA probe for oligonucleotide arrays were performed as previously described . The hybridization mixture contained 12.5 μg of the fragmented sample cRNA together with defined amounts of control Escherichia coli and bacteriophage P1 gene cRNAs, produced for spiking purposes in an identical manner as the sample, and a biotin labeled control oligo (5'-biotin-GTCAAGATCGTACCGTTCAG-3') from Genset. Subsequent hybridization and washing steps were done as described by Wodicka et al. . Chips were washed with GeneChip WashB program on a fluidics station and scanned with the GeneChip scan program (Affymetrix). The principles of quantitative analysis of hybridization intensities have previously been described [16,17,56]. Data analysis was carried out under low or high stringency using the GeneChip software program. Low-stringency parameter values were: difference threshold (DT) = 20; ratio threshold (RT) = 1.5; change threshold (CT) = 15, and percent change threshold (PCT) = 30. High-stringency parameter values were: DT = 50; RT = 1.5; CT = 50 and PCT = 30. Comparative data were obtained by analyzing results from IL-4-treated RNA samples (Th2 cells) compared to those from IL-12-treated RNA samples (Th1 cells) as baseline. All intensity values below 20 were assigned a threshold value 20. The data reported here is from the more rigorous high stringency analysis (cutoff range > 1.5-fold). The GenBank accession numbers of the sequences used for the initial microarray design and reported here are as presented in Table 1 and as follows: BAX (U19599); c-Jun (J04111); granzyme B (M28879); IFN-αβR (X77722); IFN-γ (X13274); IFN-γRβ (U05875); IL-4 (M13982); IL-5 (X04688); IL-8 (M17017); IL-13 (L06801); IL-7R (M29696); IL-12Rβ2 (U64198); IRF-1 (X14454); MIF (M25639); MIP-1α (M23452); MIP-1β (J04130); SLAM (U33017) and Smad2 (U59911). Where CT1(target) and CT2(target) represent the CT values for the target gene of Th1 and Th2 samples, respectively. CT1(GAPDH) and CT2(GAPDH) represent the CT values for the GAPDH gene of the Th1 and Th2 samples, respectively. We thank Tuija Kyrola and Paula Suominen for technical assistance and Nina Johansson for critical review of the manuscript. This study was supported by grants from the Academy of Finland, National Technology Agency (TEKES) and Turku University Hospital Fund.